This time of year with heaters turned on our skin can feel dry, cracked, and generally be in need of some extra moisture from lotions or lip balm. Plants don’t need lotion, but some of them will need a more humid environment to avoid their leaves curling, browning, splitting, or spotting. If you are seeing a sudden shift in the health of your plant this season humidity may be the problem! Many of these plants will want to be watered less during this time of year, so misting and/or creating a humidity tray will help prevent you from over watering. 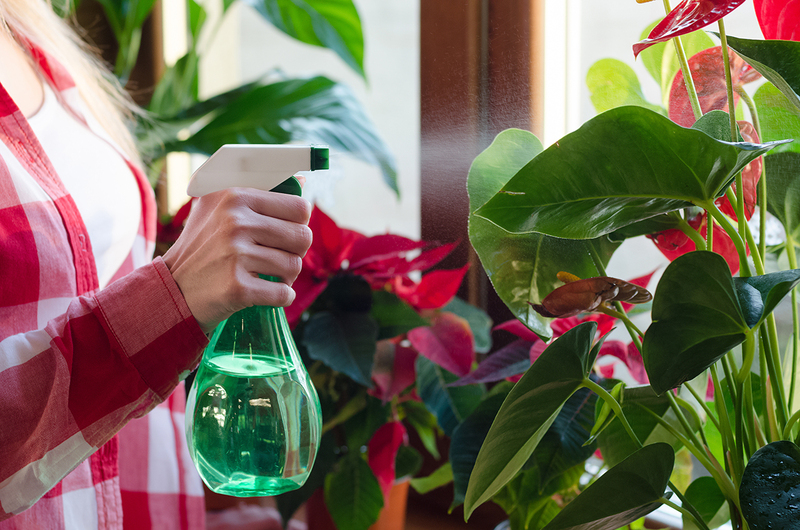 Moving plants away from vents and drafts will also help prevent problems with humidity. Mist plants 2-3 times a week. We have the Florasol sprayer ($9.95) which creates a very fine mist and is gentler on the hands then traditional misters. Create a humidity tray. Place a tray under the pot that is at least 2” wider than the base of the pot. Put rocks into the tray and fill with water until the water is at the same level as the the top of the rocks. Place the pot on top of the rocks but not in the water. This will create a source of water that will evaporate into the air rather than be sucked up into the roots essentially creating a “bubble” of humidity around the plant. You can even use decorative rocks to make a statement!